The Canadian teenager defeats Kamil Majrchzak in the singles final. 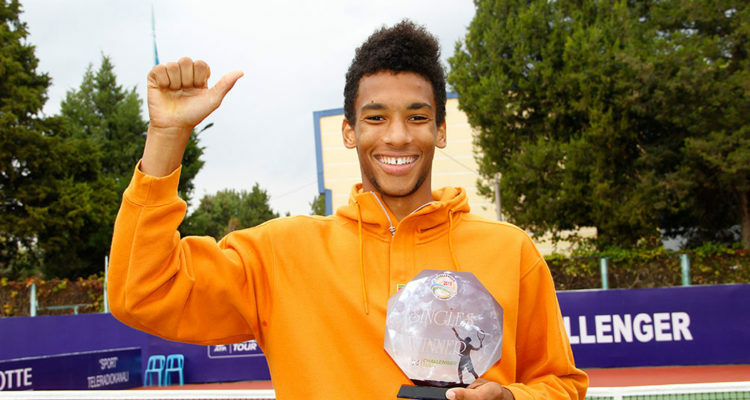 Félix Auger-Aliassime has clinched his fourth career title on the ATP Challenger Tour. The 18-year-old Canadian beat Polish youngster Kamil Majchrzak 6-3, 6-2 in Saturday’s singles final of the Tashkent Challenger. Auger-Aliassime, who battled through the qualifying of the $75,000 hard-court event, sent down seven aces, saved the only break point he faced, converting three of his own to secure victory in one hour and seven minutes. Sealed with a second serve ace. Felix Auger-Aliassime is the champion in Tashkent! By lifting his second trophy of the season, the teenager takes away from Uzbekistan $10,800 in prize money as well as 80 ATP-Ranking points. On Saturday, Sanjar Fayziev and Jurabek Karimov took the doubles title. The local wild card entries fought past Federico Gaio of Italy and Spaniard Enrique López-Pérez 6-2, 6-7(3), 11-9. The final lasted one hour and 30 minutes. The pair claimed their maiden crown on the ATP Challenger Tour. This entry was posted in ATP Challenger News, ATP Challenger Tour and tagged ATP Challenger Tour, Felix Auger-Aliassime, Tashkent Challenger.